We shot across to the Weedbeds for a quick fish again Sunday morning. It really is a great spot to take the family when the Mackerel are on. We initially headed over to the deeper water off Long Beach to float some Pillies in a burley trail, but a stiff early morning breeze made things difficult. The tide was still running in and the wind was in the opposite direction. So the burley and lines just did work properly. We managed to raise a few fish in the trail and missed a couple, but overall it was very quiet. We persevered until the tide turned and when that didn't improve things we decided to try trolling to locate the fish. We trolled toward the Cape for almost an hour and couldn't even raise a Grinner. The water was very clear and we could easily see the bottom in 4.5m. I think it was just too clear and the Mackerel were spooking easily. So a change in plans was in order. I decided to head in closer to the creeks where bait should now be running out with the tide. I moved into about 3m of water and deployed the trolling lines. It wasn't long and I spotted a few fish flicking on the surface with some bait. Sure enough, as soon as the boat moved through the bait one rod went off. A nice solid fish and, to my surprise, a health Spotty was lifted over the side. Lines back out and we continued to troll the area. Using the Side Image capability of the Humminbird 998 I managed to locate the schools of Mackerel fairly consistently. And every time we trolled past the school we got a hook up. We even managed a couple of double hookups! In fairly short time we put a good half dozen Spotted Mackerel and one nice Doggie into the eski. A few smaller fish were let go and numerous hits that didn't hookup. I also managed one nice Spotty on a small 20g slice thrown into the school on my little Stella 1000fe. Great fun on light line. 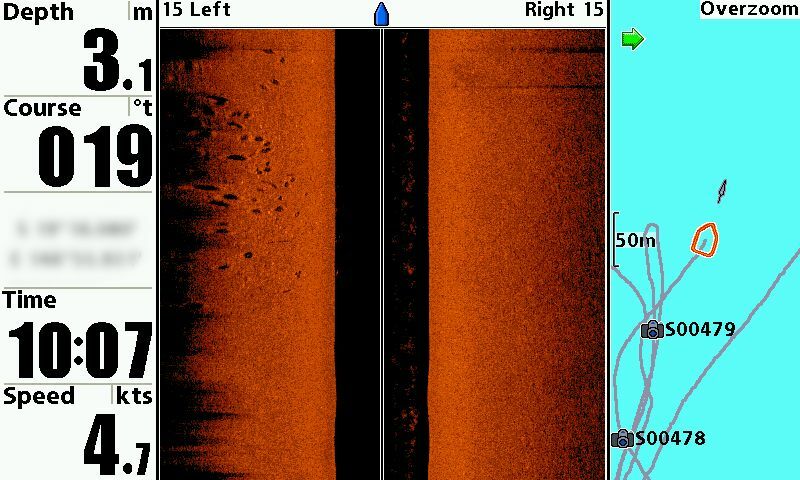 This sounder shot shows what the Mackerel looked like on the 998 Side Image. I have only ever caught one or two Spotten Mackerel incidentally in an entire season, and have never seen so many in one spot. But apparently they use to frequent this area in massive numbers before the seine netting. Its really nice to see them back in good numbers. Let hope they continue to frequent the area in the coming months.